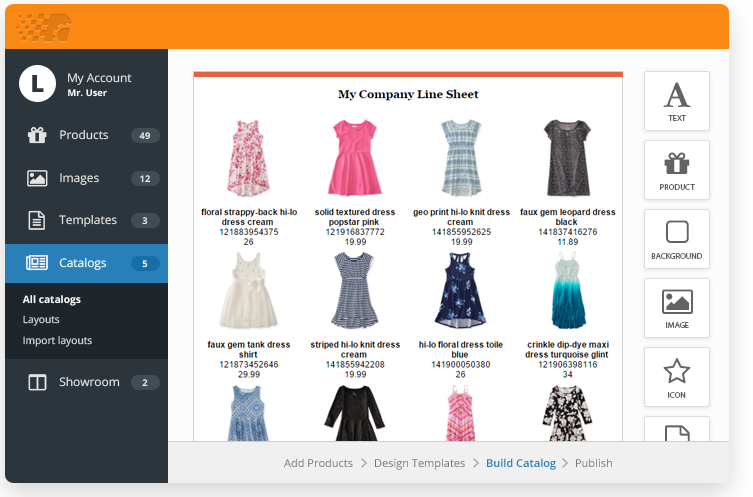 Catalog Machine is a fast and easy way to create online and share professional product catalogs, price lists, order forms, line sheets and lookbooks. Why create a product catalog for Shopify Shop? As a maker, wholesale or retail company, your customers may expect a product catalog in a variety of formats; online, as a PDF, and in print, in addition to your website and online or physical store. You may need to combine a catalog with price lists, order forms, line sheets and lookbook templates. If you need to sell your portfolio of products or services through multiple outlets a product catalog could be vital sales tool to your business. If you are not a graphic or web designer and the thought of investing hundreds to engage one is not for you then it’s well worth considering an online catalog creation app like Catalog Machine. It could become an important part of your digital marketing strategy. 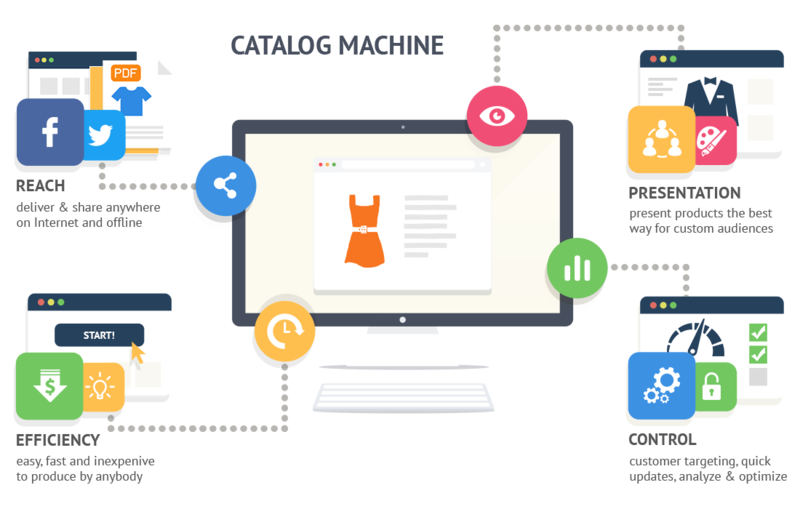 Catalog Machine allows you to work online to quickly and easily to create a product catalog to complement existing marketing tools and strategies. With Catalog Machine you can add or import products and create your entire product database online, making it easy to drop in your products and their specifications and produce a final, highly effective, product catalog. The software enables the creation of multiple, alternative custom product catalog templates which you can combine into your final product catalog. PDF and HTML creation is fully supported and there are options for mini catalogs and Product Showroom. Your Catalog Machine product catalog is optimized for social media and available for you to share in the format you need, making it simple to deliver to your customers to maximize sales. Use it in email, social media and online marketing campaigns. Catalog Machine and your product catalog are accessible 24/7 wherever you are in the world. Import and sync Shopify Shop products and images to Catalog Machine Database with one button click. Create beautiful online product catalogs for your Shopify Shop in PDF & mobile-friendly HTML. 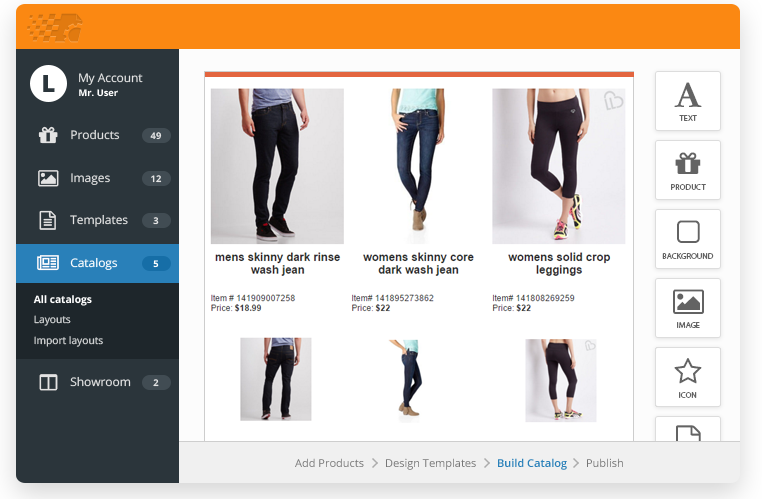 Build customized product catalogs with advanced templates for individual markets, customers and events. Share product catalogs for your Shopify Shop in social media, send in email, download PDF or embed into your website. Edit all fields, descriptions, prices, extend product with new fields and upload additional product images, charts and shots. Create professional retail sales sheets, wholesale line sheets, datasheets and technical spec sheets for your products. Import Shopify product variants, SKU, prices and options for your collections. Create custom product categories. Powerful marketing tool for your online business, digital marketing and product promotion. 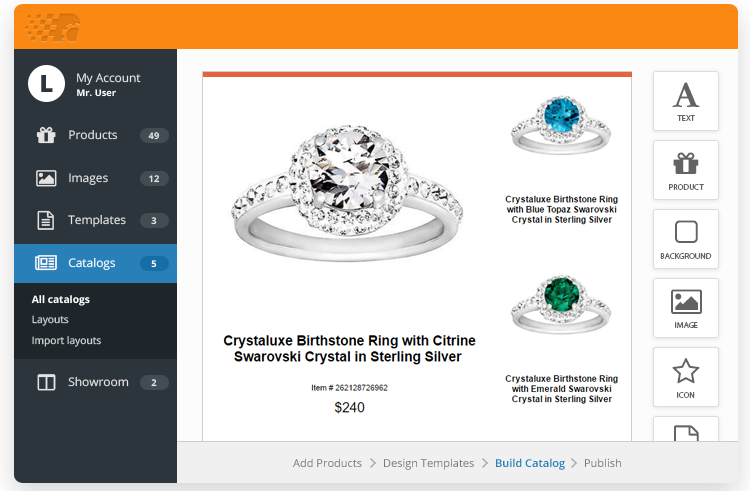 Use the Catalog Machine app to create, edit or import your products and images then quickly add them to your catalog template. Extend with custom fields / variants / options including images, prices, barcodes, market description, specifications and more. Use catalog templates and layouts to easily display your product prices, images and description, or create your own catalog design with the flexible product catalog maker. Complete your catalog by adding custom text, images and marketing material or build your own pages for company, order information or terms of business, product guides, articles and more. Re-import or change your products in the Catalog Machine database with automatic update in your catalogs. Clone your catalog versions and set privacy levels up to password protection. Share by email, social media as a catalog URL, download or send as a PDF, embed to your site quickly and cleanly to make product marketing promotion painless. Build your catalog and update products with your team in multi-user mode. Work as an agency with multiple accounts linked to your login. Understand both your products and the target audience. Realize where top sellers, discounts and deals need to be featured and how your products need to be grouped. Good product grouping, or product layout will maximize results. Consider including an order from, introduction, CEO’s message, editor’s notes, guides or contents page for ease of navigation. Write with the core product benefit in mind for your reader, building the other information around the core benefit. Solving the problem or meeting the desire of the customer is often more important than how a product works, who made it, and how well it sells. Ensure a product’s value, and value to the buyer is detailed alongside the benefits and any relevant exclusivity. A beautiful image is “worth a thousand words” and it is true. Great product photography can make or break sales. Poor quality will vastly diminish the product’s value. Keep product descriptions well written but short. Maybe 50-150 words, focus on the main selling point but utilise features and benefits as much as how it works. Bestselling and high profit generating products should receive prime position and the most space allocation. Balance images and text throughout for the right mix of information and engagement. Only group products which are similar or related. Grouped items which are not related don’t work well. Maximise opportunities to cross sell, placing companion products together on a page can increase sales 5-15%. Upselling is an effective way of increasing order value and sales. Keep your catalog focused on the products, an overly detailed design could detract the reader from their purpose. Make sure design, image and copy are product oriented, clear and concise. Establish a design or template that you will use throughout, changing only for the eye catching bestselling, feature or surprise pages, then reverting to the familiar flow. Keep colours, typography, font and layout styles consistent and ensure your brand is prominent and well used throughout. Try testimonials, guarantees and assurances, company history or CEO’s message. Include visible mark down of product prices, featured products, bestsellers, deals and discounts. Market your products with the goal of selling them, good, concise descriptions, answering any objections and showcasing your goods. Link to more detailed descriptions on your website, channelling customers to where they can quickly buy there. Use any digital channel you can access: email, website, social networks. Target your specific audience through savvy social media marketing application for maximum return. Make sure you cross sell by promoting your website alongside your catalog and your catalog on your website. Try email marketing of a digital product catalog is a practical way to engage passive or previous customers with your entire product lineup. Digital catalog creation software can be accompanied by precise analytics, often powered by or compatible with Google Analytics. Data mining the results can help to understand traffic sources and patterns, visitors and their behavior. A/B split testing of catalog versions (small variations of the same base catalog presented to similar visitors) helps to select winning combination of elements and products for the best performing catalog. Analysis, experiments, then recommendations, can help to improve an online catalog quickly and with much return. Unlike print catalogs, a digital or online catalog can be constantly improved with little additional cost. 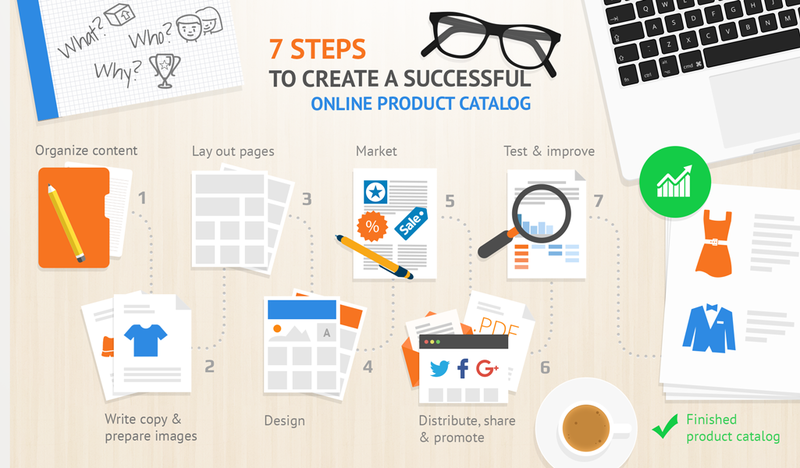 Read more about these steps in our blog post 7 steps to create an online product catalog that sells .